The Chess Drum has received news of the death of R.O. Mitchell from Memphis resident Carlos Sims. The only available information comes from a police statement saying that Mitchell had been found on May 29th in his apartment in an unresponsive state. They added that he had been that way for about two weeks. Cardiac arrest has been cited as the cause of death. R.O. Mitchell, 35, was a native of Nashville, Tennessee and won his claim to fame by winning the 1990 US Junior Open Championship in Charlotte, North Carolina. He was the first Black player to accomplish that feat and it wouldn't be until 1997 when Shearwood McClelland III would repeat the task. However, little mention was made of Mitchell's accomplishment in Chess Life and the title is one of the most prestigious. Nevertheless, his name will be forever etched on the slate of national champions. Mitchell gradually faded away from the chess scene and took a long hiatus from active tournament play until resurfacing in 2003. He played mostly in locals and then played in the 2005 National Open. "I met R.O. a couple of times when playing events in Memphis - we had some nice conversations which were easy to come by since we both were strong players that loved the game and attended the same high school - Hume-Fogg. R.O came off as one of the most jovial players of the game that I had ever had the pleasure to meet. He seemed happy and he loved his chess." R O Mitchell was the son of Rev. Richard O. and Rev. Laura Mitchell. He was born 1971 in Nashville, TN. R O graduated from Hume Fogg Magnet School and received a bachelor and 2 master degrees from the University of Memphis. He was introduced to both chess and Spanish at an early age and his dedication and ability to absorb and apply knowledge led to excellence in both areas. 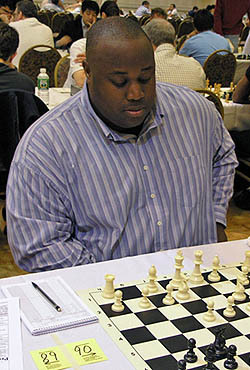 R O won the 1989 Tennessee Junior Open Chess Tournament and the U.S. 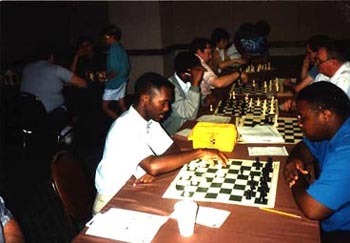 Junior Open Chess Tournament in 1990. He also played in the U.S. Junior Closed Tournament. He taught Spanish in the Memphis Schools for one year and tutored athletic students at the University of Memphis and many private students; both in math and Spanish. At his death, he was an instructor in the Continuing Education program at the University of Memphis. R O was skilled in writing so much so that one of his English teachers at Hume Fogg could not believe that he had written a story he turned in for an assignment--it was so well written. R O was a focused thinker, who also had a great love for God and others. His light glowed brightly and will not be dimmed by death because of how he influenced others while he lived. "Sorry about the long time its taken for me to respond. Please, send me a couple of your best games and me tell how things are going. OH YEAH! I JUST WON THE U.S. JUNIOR OPEN, I'm also a Master - I'll send you some games." To the best of my knowledge, he never represented the U.S. in any international tournaments after winning the title. He reached the 2200-mark a few more times and earned the high mark of 2208. I reunited with him at the 2006 World Open and informed him about The Chess Drum. Gary Pylant of Memphis Chess Club stated that R.O. had a Master's degree in Spanish and was working toward a Ph.D. He was certainly a fine young man and I was glad to have met and befriended him. Maurice Ashley (now GM) analyzing R.O. 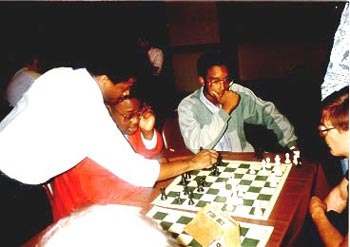 Mitchell's game (with his seated opponent) at the 1989 U.S. Open in Chicago. Kimani Stancil looks on. R.O. Mitchell came from nowhere to win the U.S. Junior Open in 1990. Stancil, also a young star in this picture, earned his Ph.D. in Physics from MIT in 2002. Copyright © 1989, Daaim Shabazz.